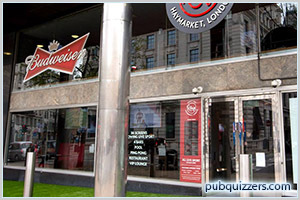 Rileys Sports Bar Haymarket | Pub Quizzers | Find a pub quiz near you, now. Pub quizzes take place at Rileys Sports Bar Haymarket, West End, Haymarket on Mondays (weekly) at 19:00. Entry is £2.00, you can have up to 10 people on a team. There are prizes of drinks, food. Happy quizzing! A mix of sport and general knowledge, picture, quick fire, true / false and name that score rounds.